toes tappin', knees rockin' and get you bouncin' out of your seats!" • Click Here to You Tube for samples of our repertoire and performances. 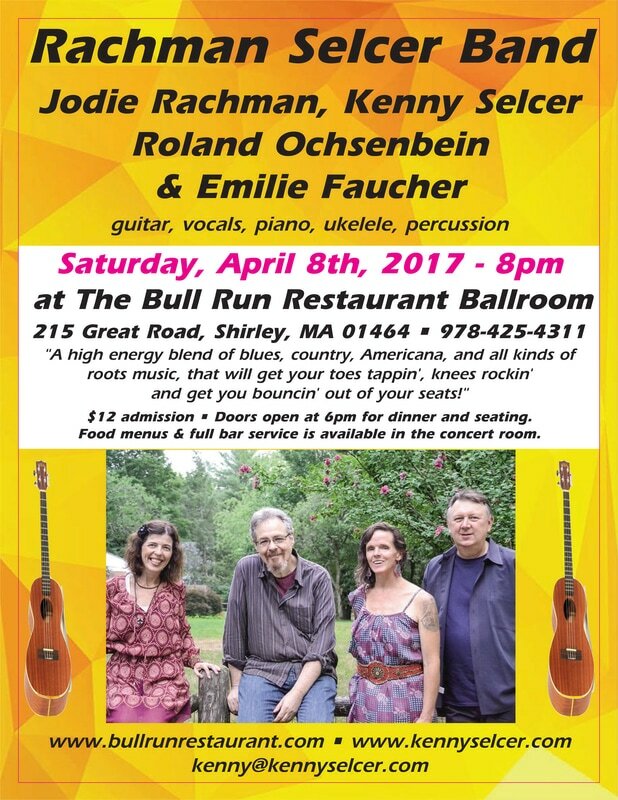 Come hear The Rachman Selcer Band (Jodie Rachman, Kenny Selcer, Emilie Faucher and Roland Ochsenbein in concert. Vocals, guitar, ukelele, percussion and piano! 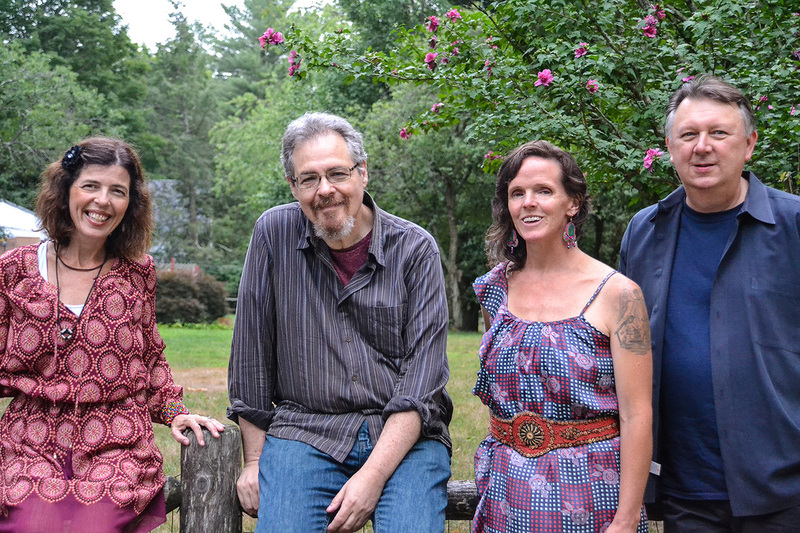 Jodie (vocals, percussion and ukelele) and Kenny (guitar, vocals) came together as a duo when they found they had a mutual love and passion for old rock and roll, jug band, blues, New Orleans, country, r&b and The Grateful Dead. Jodie’s high energy voice, steeped in blues and old traditonal country and Kenny’s mesmerizing guitar, with roots in rock, jazz, funk and Americana, combined with Emilie’s (vocals, percussion) wide musical influences and Roland’s (keyboards) New Orleans flavored rock and roll piano, make “a high energy blend of blues, country and Americana that will get your toes tappin', knees rockin' and get you bouncin' out of your seats!" Jodie Rachman's influences are Beatles, CSN, Neil Young and Grateful Dead. She plays the ukulele and roams freely around classic country, blues, gospel, New Orleans style funk and much more. Kenny Selcer brings his heart and soul to guitar playing, melding the blues rock of Eric Clapton, the lyricalness of Jerry Garcia, with a hint of jazz, composing while he plays. He is influenced by rock and roll, world music, folk, Americana, jazz and everything in between. Emilie Faucher has soaked up a bounty of musical flavors. Edith Piaf, Jimi Hendrix, the BeeGees, the Cheiftans and The Fantastics. Grease and Free To Be You and Me soundtracks are consumed on a regular basis, building a foundation of passionate musicianship. Roland Ochsenbein plays American blues and roots piano in the styles of Pinetop Perkins, Otis Spann, Dr. John, Professor Longhair, Fats Domino, Jelly Roll Morton, Jimmy Smith, Johnnie Johnson, Chuck Leavell, Bill Payne, and many others. He loves to drive rhythms and cook up innovative solos that sometimes soar and sometimes end in spectacular trainwrecks.